The Squadron embarks upon its second year …. Personnel of Flight “B” of 409 Squadron pose with a Beafughter Mk. 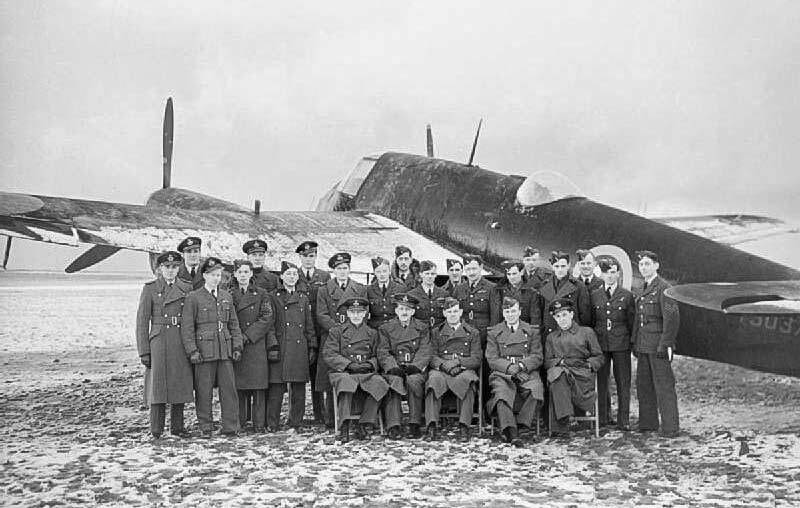 II at RAF Station Acklington in January 1942. It looks cold! On 8 March 1942 S/L R. M. Trousdale, DFC, a hard flying, sharp shooting New Zealander, knocked down an He. 111 near Grimsby. Hopes ran high, for there were definite signs of increased German activity in the air, but a few fleeting blips and exciting chases were the only operational events recorded in the squadron diary until 7 April when Trousdale again destroyed an enemy bomber and thereby won a bar to his DFC. 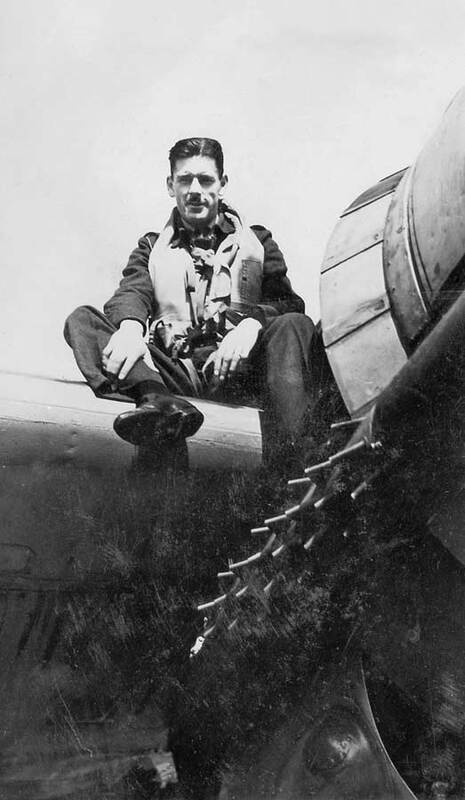 Lloyd Marr sitting on the wing of a Beaufighter next to the engine cowling. Early in June the Beaufighter V’s were turned in for faster and more maneuverable Beau VIs. The crews were spoiling for a chance to try out their new kites in action and they had not long to wait for the fine summer weather and Hitler’s rage brought the Luftwaffe into Britain’s skies to seek reprisal for the tremendous damage that Bomber Command was now inflicting on the Fatherland. F/L E. L. McMillan (RAF) was the first to score with the new aircraft when he destroyed a Do. 217 and damaged another on the night of 23/ 24 July. These victories were followed by four more in July, including a pair by Davoud and Carpenter, and seven in August. Nine Nighthawk crews took part in these encounters which resulted in one enemy aircraft destroyed, four probably destroyed and eight damaged. Most of these engagements were against twin-engined Do. 217s which were almost as fast as the Beaufighters, thus making it necessary for the night fighter pilots to push their aircraft to the limit for the ardently sought tally-ho. The wily Hun pilots had learned a lot about our night fighting tactics and led the Nighthawk crews on many an exciting moonlight chase as they weaved, dived and made violent and skillfully executed peel offs and hard stall turns in an effort to throw their pursuers off their tail. These manoeuvers meant the use of deflection shooting 95% of the time and the idea that the night fighters had simply to position themselves dead astern and open fire had to be disregarded. These summer victories got the squadron off to what the diarist called “a good start”. The crews were eagerly looking forward to more “joy” at Jerry’s expense but the German High Command, finding that our night fighters were taking too heavy a toll of their aircraft to make a sustained attack worthwhile, called off their bombers for the time being. Nevertheless, Britain’s air defenses had to be maintained lest Germany launch an offensive to halt the preparations for the invasion of Western Europe which were now going ahead in earnest.